Eamon O'Donnell and Paul Hughes outside Bishop Street Courthouse after they were cleared of obstructing a road. Eamon O’Donnell and Paul Hughes were charged with obstructing a road during a protest about the failure to publish the study. Both men are community workers in the Strathfoyle area and contested the charges on the basis that they had a reasonable excuse to obstruct the road. 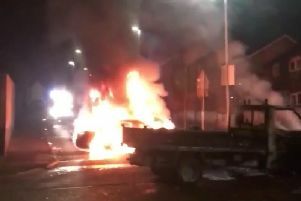 Derry Magistrate’s Court heard that O’Donnell and Hughes blocked the Port Road for up to half an hour and there was a ‘tailback’ of traffic. It was alleged tensions were ‘frayed’ as a result. Police were called and an officer told the court he tried to reason with the men to get off the road. However, the men said they would return to continue their protest and block the road. Giving evidence on his own behalf, Eamon O’Donnell told the court he and Mr Hughes were holding a ‘legitimate protect to get the health impact assessment study published’. The health impact assessment was commissioned and paid for by Derry City Council to assess the impact of heavy industry on the health and well being of people in the area. The court was told 24 hours before the study was due to be published the Port and Harbour Commission launched a legal challenge. The court heard an Injunction was sought to block the publication of the study and a judicial review was launched. Mr. O’Donnell said the report still has not been published and “no one was answering our questions. That was why we were standing on that road blocking traffic. Mr O’Donnell added he has been a community worker in Strathfoyle for many years and he was ‘exercising my duty of care to the young people I represent’. He said it was his ‘moral duty and I had a reasonable excuse to be there - to bring attention to these issues’. Dismissing the charges District Judge Barney McElholm it was ‘unreasonable that a public body should prevent the publication of a report which is very important to the people of this city’. He said the study was a ‘matter of intense public interest and should be a matter of intense scrutiny by the public’. The judge added that the ‘voice of the people should be heard’. “They were frustrated at not having any alternative forum to do so. Commenting outside the courthouse, both men said they felt they had been ‘vindicated’ by the dismissal of the charges by the court. They also called for the health impact assessment to be published and the recommendations implemented.